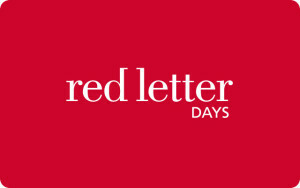 •	Select your experience at https://www.redletterdays.co.uk/credit and use your eGift code as full or part payment; •	Certain restrictions may apply to experiences and full details are available online at www.redletterdays.co.uk/terms•	Any remaining balance on your card may be used towards future purchases. •	This voucher code expires 12 months after date of purchase and the remaining balance will be deducted. •	Credit can be used until the original expiry date of the voucher and is non-refundable. •	This voucher is for experiences only. •	This card cannot be refunded or exchanged for cash, no change will be given and we cannot replace lost, damaged or stolen cards. •	This voucher code is not a credit, charge or cheque guarantee card. •	Discount codes cannot be used in conjunction with this. When you’re all about experiences, you can’t go wrong with Red Letter Days. Here you can be sure to find a unique and delightful day out, event or activity to enjoy for just about everyone! Surprise a lucky recipient with a Red Letter Days gift voucher and you’ll be giving the gift of memories to last a lifetime too. Adrenaline junkies can look to driving or flying experiences to really get their hearts racing, while those looking for a little TLC can find pampering and spa days galore to help them unwind. Treat your partner or pal to a short weekend break when you opt for a Red Letter Days gift card, and give them the chance to getaway for a while. Perfect to let another try something different, something new - jump into a hot air balloon, go glamping or indulge in a decadent 3-course meal in the country - Red Letter Days will always have the most enticing of activities and experiences for everyone to enjoy.